LocHooks™ Industrial Strength Hooks are the ultimate building block for organization and storage using the LocBoard system. • Hooks mount in four directions offering storage solutions for nearly any item, while maximizing the use of storage space. • LocHooks can be positioned or combined with one another to increase holding power and offers storage solutions for those odd shaped tools. • Incorporate hanging plastic bins into your system using our patented 57500 BinClips. • LocHook’s rugged 3/16” and 1/4” bright zinc-plated steel construction is designed and tested to meet the toughest commercial and industrial applications. • Styles never before offered. 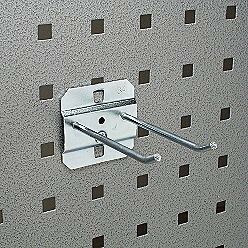 • LocHooks fit most steel boards with square holes 1-1/2" O.C. • Use with Triton Products LocBoard family of products. Never worry about these hooks coming loose or falling out. • Heavy-duty welded construction with Zinc Plating offers years of secure holding power.